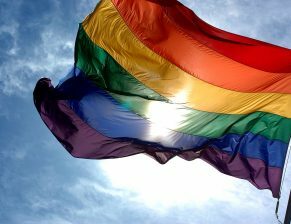 It is my duty to honor, respect, and protect the Constitutional rights of all Americans. In Congress, I have supported legislation to protect the civil rights of all our citizens, and have fought against backwards policies that seek to allow discrimination against members of our community. 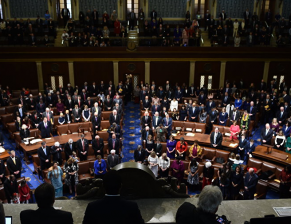 Today, the U.S. House of Representatives passed H.R. 1, the For the People Act, which includes two bills authored by Congresswoman Julia Brownley (D-CA) to strengthen our democracy by ending partisan gerrymandering and requiring same-day voter registration. Today, the House Administration Committee passed H.R. 1, the For the People Act, which includes two bills authored by Congresswoman Julia Brownley (D-CA) to strengthen our democracy by ending partisan gerrymandering and requiring same-day voter registration. Congresswoman Julia Brownley (D-Westlake Village) released a statement today after she was sworn in to the 116th Congress. 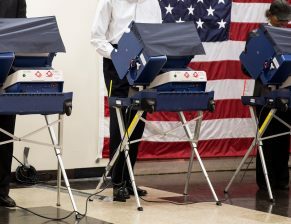 Today, Congresswoman Julia Brownley (D-CA) introduced her first bill of the 116th Congress: the Same Day Registration Act, legislation that would require all states to allow same-day voter registration for all federal elections. Brownley’s legislation was introduced as the new House Democratic Majority’s effort to restore democracy gets underway. Rep. Julia Brownley (D-Calif.) is kicking off the new Congress by introducing a bill that would rewrite federal laws with more gender neutral terms. Right now, just 17 states and the District of Columbia allow same-day voter registration, and the bill, introduced by Rep. Julia Brownley (D-CA), would mandate that the rest of the country join them. 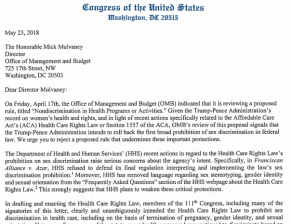 A group of 127 House Democrats is calling on White House Office of Management and Budget (OMB) Director Mick Mulvaney to reject a proposal that would roll back ObamaCare’s anti-discrimination protections for transgender patients. Today, Congresswoman Julia Brownley (D-CA), Congressman Jerrold Nadler (D-NY), Congresswoman Diana DeGette (D-CO), and Congresswoman Barbara Lee (D-CA) spearheaded an effort by 127 House Democrats to call on Office of Management and Budget (OMB) Director Mick Mulvaney to uphold the Health Care Rights Law, also known as Section 1557 of the Affordable Care Act, which protects patients from discrimination in health care. 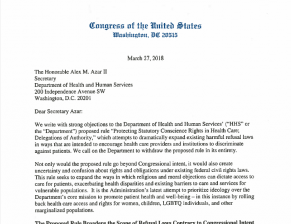 Today, Congresswoman Julia Brownley (D-CA) and Congresswoman Barbara Lee (D-CA) spearheaded an effort by 104 House Members to call for the Department of Health and Human Services (HHS) to withdraw its proposed Refusal of Care rule. This rule would dramatically expand the ways in which the personal beliefs of healthcare providers can dictate access to care for patients — a discriminatory policy that would be especially harmful to women and LGBTQ individuals. The letter urges HHS to withdraw this proposal and instead focus on expanding and improving health care access and coverage for all Americans. Congresswoman Julia Brownley issued a statement today regarding her support for a Congressional Review Act resolution to reverse the FCC’s recent actions undermining net neutrality. Congresswoman Julia Brownley issued a statement today on passage of a resolution requiring anti-harassment training for all Members and employees of the U.S. House of Representatives. Sunday marks the anniversary of Roe v. Wade, when the Supreme Court of the United States affirmed the constitutional right of women to make decisions about their own health care without interference from the government. The election may have passed, but I join millions of Americans across the country who stand firm in the resolve that our nation will be one that works for everyone — a stronger, inclusive America built around uplifting and empowering all of its citizens. Today, Congresswoman Julia Brownley issued a statement regarding the Maloney Amendment to the FY17 Military Construction and Veterans Affairs Appropriations Act (H.R. 4974). Today, the House Transportation and Infrastructure Committee adopted two amendments offered by Congresswoman Julia Brownley (D-Westlake Village) to the Aviation Innovation, Reform and Reauthorization Act (AIRR Act/H.R. 4441). 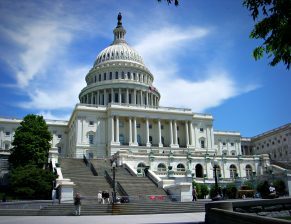 The bill will reauthorize Federal Aviation Administration programs, including the Airport Improvement Program, address aviation safety, improve the aircraft certification process, and privatize air traffic control services. Hours: Please call to make an appointment. Sign up now for updates on how I am fighting for Ventura County’s priorities in Congress.